We increased our number of paid users by 100% when sellers ramped up their activity after the Chinese New Year celebration. AWS supported this growth with no deterioration in performance or availability. Founded in 2012 in Taiwan, BQool provides software that helps Amazon sellers manage reviews and feedback as well as compete with rivals on price. Since 2013, BQool has launched three software products. The first—Repricing Central—enables sellers to automatically adjust the price of their merchandise when a competitor changes the price of its own products. The other two—Feedback Central and Review Central—enable sellers to aggregate and respond to feedback and reviews. With about 60 percent of its customers located in mainland China, Hong Kong, and Taiwan, BQool has made its products available in simplified Chinese and traditional Chinese. English-language versions of the products support customers based in the United States and Europe. BQool markets itself to prospective customers by advertising on Google and participating in Amazon forums and discussion groups. BQool’s founders decided to launch a one-stop shop for Amazon sellers to manage their merchandise listings and marketing. “Many of our competitors provide only one solution, such as managing reviews. This means that sellers need to log in to multiple solutions to manage the Amazon sales and marketing processes. We wanted to become the only solution provider that sellers need to successfully undertake sales and marketing on Amazon,” explains Magnus Wang, chief technology officer at BQool. BQool’s founders realized that the upfront cost of buying servers, storage, networking, and associated equipment to run BQool from an on-premises or colocated data center would render the business unviable. They needed an infrastructure that a small technology team could manage, with on-demand access and a monthly payment scheme based on resources consumed. In addition, the infrastructure had to provide the availability required to meet customer demand and deliver the agility to deploy new products and services quickly. BQool also wanted to work with an infrastructure provider that could lend credibility to its services to potential customers in a range of markets worldwide. In addition, the business needed an infrastructure secure enough to withstand hacking or denial of service attacks in order to retain customer confidence. BQool initially acquired an on-premises server to develop its applications as the business explored infrastructure options. It soon realized the server could not scale to meet demand and the Internet bandwidth available to the business was often overwhelmed. The business then tried using a web server at a hosting provider, but a distributed denial of service attack shut the server down for four hours, prompting three paid users to cancel their subscriptions. As these incidents occurred, BQool completed its cloud-provider evaluation and elected to develop and deploy its software tools through Amazon Web Services (AWS). “We wanted to make our products available from the cloud to enable customers to access them from any location with an Internet connection. Given that we are targeting Amazon sellers, running on AWS was a logical decision. Our other primary considerations included the maturity, scalability, and stability of AWS, as well as our ability as a global company to deploy infrastructure in data centers around the world,” says Wang. BQool relied primarily on the skills of its internal team to deploy an AWS architecture to deliver its software tools. The business was able to deploy its first Amazon Elastic Compute Cloud (Amazon EC2) instance in just four hours and its first Amazon Simple Storage Service (Amazon S3) bucket in only three hours. “One of our team members completed an AWS certification, and he played a crucial role in setting up our architecture, particularly in deploying servers quickly in Amazon EC2,” says Wang. However, BQool ran into some problems installing the newest Microsoft SQL Server database in the AWS architecture. BQool requested assistance from AWS Singapore. “The team from Singapore flew to Taiwan and helped us install the latest version of SQL Server. I don’t think any other cloud provider would have provided the same level of service,” says Wang. BQool is now using Amazon EC2 to run web and application servers, including a server used to analyze data such as pricing history, sales performance, product reviews, number and type of competitors, and the historic value of products sold on Amazon. BQool is backing up information from these servers to durable Amazon S3 buckets. Amazon Simple Queue Service (Amazon SQS) queues and sends advisories of competitor pricing and inventory amendments to the BQool repricing engine—a Microsoft SQL Server database running on Amazon Relational Database Service (Amazon RDS), supporting NET applications that were developed in house and apply rules set by customers—which adjusts customers’ prices on Amazon. BQool also uses Amazon Simple Email Service (Amazon SES) to send emails to customers notifying them of positive or negative feedback that should be reviewed or addressed. 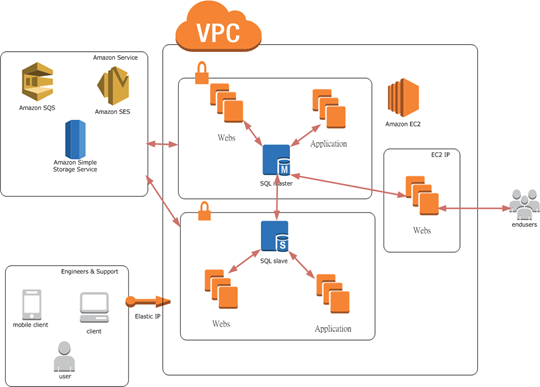 The infrastructure runs in an Amazon Virtual Private Cloud (Amazon VPC) to isolate the database and other sensitive systems from attacks over the Internet. BQool has grown to 40 employees and from 10 to 1,000 paid users using AWS tools and technologies. The AWS architecture is delivering 99.999 percent infrastructure availability, with outages occurring only when the business needs to undertake database or application upgrades. BQool was able to maintain this level of availability when demand for its services surged during a holiday week in February 2015. “We increased our number of paid users by 100 percent when sellers ramped up their activity after the Chinese New Year celebration, as a result of a post Chinese New Year marketing campaign. AWS handled this growth with no deterioration in performance or availability,” says Wang. China has become an increasingly important market for BQool due in part to the company’s decision to run on AWS. “When we started our business, nobody knew who we were. Having the AWS logo on our website and having it linked to the AWS website gave us considerable credibility. We found most of our users in China clicked on the AWS logo, and that gave them the confidence to sign up for our services,” explains Wang. The ability to provision compute, storage, and associated infrastructure resources in minutes has enabled BQool to develop and launch new services up to a month faster than in an on-premises environment, resulting in substantial cost savings. This agility is helping the business to develop a tool that customers can use to analyze millions of Amazon listings for pricing histories, competitor information, and similar data, and to plan sales strategies accordingly. Using AWS, the business has been able to preserve a lean cost structure and devote most of its personnel and resources to delivering a positive experience for its users. “We only need one full-time engineer with AWS, instead of three engineers for a physical infrastructure. AWS is very stable so it doesn’t give us any problems,” says Wang. The security of Amazon VPC and the Amazon data centers themselves—including electronic surveillance and multifactor access control systems—is enabling BQool’s internal technology team to relax, knowing that the company’s data and applications are well protected. “We can sleep like babies at night and have not had any security incidents since we moved to the AWS cloud,” says Wang.